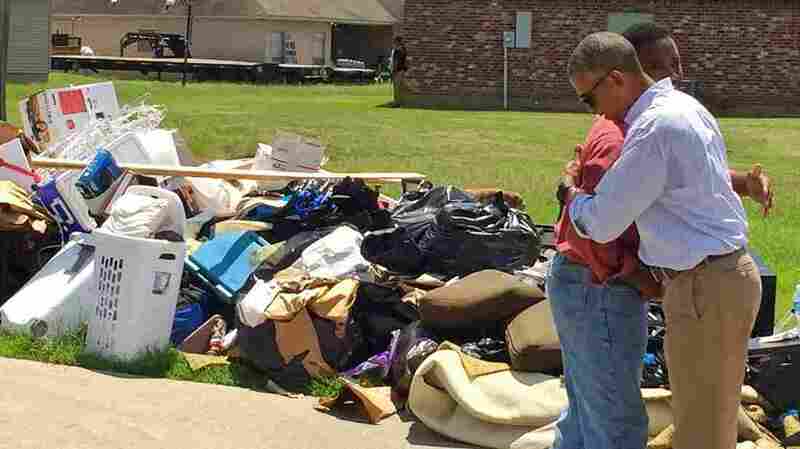 President Obama Tours Flood Destruction In Louisiana : The Two-Way Obama visited a neighborhood in East Baton Rouge Parish more than a week after flooding hit southeastern Louisiana, killing at least 13 people and damaging or destroying more than 60,000 homes. President Obama walks with a family to tour their flood-damaged home in the Castle Place neighborhood of Baton Rouge, La., on Tuesday. 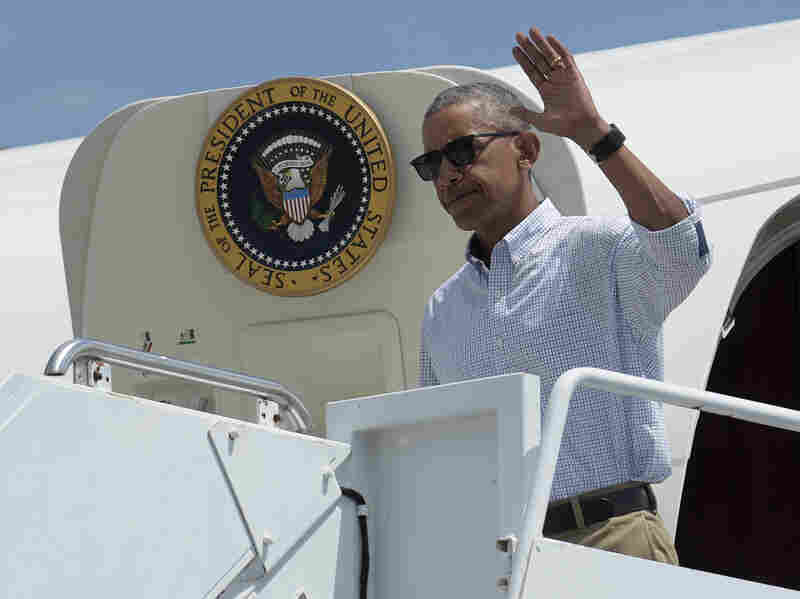 More than a week after record-breaking rain inundated 20 parishes in southeastern Louisiana, President Obama arrived Tuesday to survey the damage. The president toured a neighborhood in East Baton Rouge Parish ravaged in the widespread flooding that has claimed more than a dozen lives and damaged some 60,000 homes. Afterward, he thanked first responders, the National Guard and "all the good neighbors" who rescued people as the water rose. 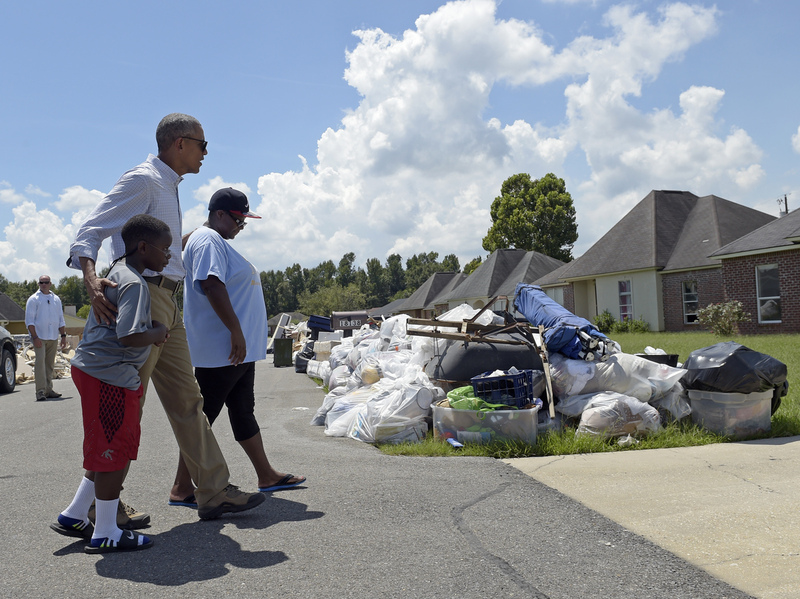 Obama tours a flood-damaged Baton Rouge neighborhood. "I come here, first and foremost, to say that the prayers of the entire nation are with everybody who lost loved ones," Obama said. "We are heartbroken by the loss of life. There are also people who are still desperately trying to track down friends and family. We're going to keep on helping them every way that we can." President Obama steps off Air Force One as he arrives at Baton Rouge Metropolitan Airport in Baton Rouge, La., on Tuesday. Obama also praised the Federal Emergency Management Agency for its work on the ground. "A lot of homes have flood insurance, but a lot of homes don't," he said, saying he had advised FEMA chief Craig Fugate to "get money out as quickly as possible" to residents who are beginning to rebuild. "[W]hat I want the people of Louisiana to know is that you're not alone on this," Obama said. "Even after the TV cameras leave, the whole country is going to continue to support you and help you until we get folks back in their homes and lives are rebuilt." Before departing Baton Rouge, the president will meet with the family of Alton Sterling, who was shot and killed by a police officer there in July, as well as with the families of local law enforcement officers who were killed and injured by a gunman later that same month. At least 13 people died in the flooding from a storm that hit the area Aug. 11 and lingered for days. The Red Cross estimates the recovery will cost at least $30 million. President Obama signed a Louisiana disaster declaration on Aug. 14, making federal disaster funding available. Homeland Security Secretary Jeh Johnson arrived in Baton Rouge on Aug. 18. His agency is in charge of the federal disaster response. The White House released a statement the afternoon of Aug. 19, announcing Obama's trip and saying, "The President is mindful of the impact that his travel has on first responders and wants to ensure that his presence does not interfere with ongoing recovery efforts." That same day, Republican presidential nominee Donald Trump and running mate Mike Pence visited areas affected by the flood. Democratic nominee Hillary Clinton, who has not toured Louisiana, released a statement saying that "relief efforts can't afford any distractions" and urging people to donate. "The Democratic governor of the state, John Bel Edwards, though, has said he has no problem with the president not having visited or the federal response.
" 'I'm not complaining in any way about our federal partnership,' Edwards said in a news conference Thursday." In a subsequent editorial today, the Advocate welcomed Obama's visit and called on him to address the housing crisis created by the flood devastation. "Thousands of displaced homeowners pose the biggest threat to the region's recovery, and some form of housing assistance beyond what FEMA's rules presently allow will almost certainly be necessary. The president can be a key voice in championing that goal. "A flood that left much of the region underwater means a huge impact on the federal flood insurance program. Now, more than ever, homeowners and businesses will need affordable flood insurance to draw investment to the region. Access to flood insurance is important not only to Louisiana, but communities across America that could easily be surprised by a flood of their own. The president can use his bully pulpit to promote a sustainable flood insurance program as a national priority, and we hope he does so." Only about 12 percent of homes in Baton Rouge are covered by flood insurance. In an interview with NPR last week, Louisiana Insurance Commissioner Jim Donelon said, "The average cost of insuring a home in Louisiana is, for many, a budget-buster." He also expressed hope that the recent flooding, which the National Weather Service estimates should theoretically occur only once every 1,000 years, will persuade more homeowners to take advantage of federally subsidized flood insurance programs. "I live in metropolitan New Orleans, and we have had so-called 100-year floods every five years since 1979," Donelon said. "Those experiences have taught property owners in the metro New Orleans area that it is worthwhile having that coverage."